Babaji Nagaraj is the infinite Universal Creator and well known as an incarnation of Shiva worldwide. 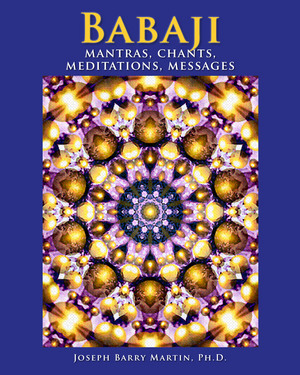 In this original document of Babaji’s gift of mantras, chants, meditations and messages to all people of this world at a time of great transformational crisis, the emanations of His Great Love will provide light, healing, courage, strength, decision and action. In the same spiritual reality as Jesus Christ and Paramahansa Yogananda, Babaji’s words of blessed relief and emancipation to the heart and soul will encourage, unify and support you on your spiritual and psychological journey as you embody His vibrational truth. What greater purpose and meaningful path can you imagine for yourself than complete conscious awareness of your being’s oneness with Source Light and Love? Open the doors of your heart and absorb the goodness, purity and compassion of the One High Love you are. Through this offering, may you exhibit TRUTH – Total Receptivity and Responsiveness Uniting the Heart. It is Babaji’s wish that the countless billions of creatures living on planet Earth at this time be blessed with full conscious health, love, light and unity. The Light, the Light, the Light IS Everything. And so may it infinitely evermore be. 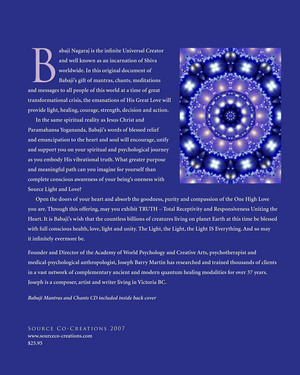 Founder and Director of the Academy of World Psychology and Creative Arts, psychotherapist and medical-psychological anthropologist, Joseph Barry Martin has researched and trained thousands of clients in a vast network of complementary ancient and modern quantum healing modalities for over 37 years. Joseph is a composer, artist and writer living in Victoria BC.